Whilst Borgward was a manufacturing company founded by Carl Borgward and dating back to 1890, it was not until 1924 that the company built its first vehicle, the 3-wheeled Borgward Blitzkarren. 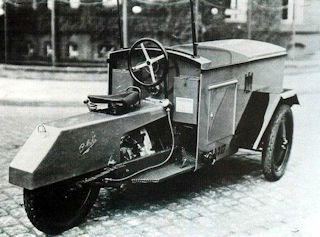 The Blitzkarren was a small delivery vehicle with a box situated between the two front wheels. It was powered by a 2hp engine that drove the single rear wheel. The vehicle found a gap in the market as and as a result was a great success for Borgward. It was built until 1929 when the company then merged with Hansa Llyoyd AG which then went on to produce the Goliath Pioneer.